Anyone who takes even the briefest glance at our body of work on this blog cannot fail to notice that we have a definite proclivity towards the porcine, and so it is that this top five is perhaps the most hotly contested monthly selection thus far. The pig is, in our humble opinion, the greatest animal on earth, and picking only five products made from its wondrous bounty was a difficult thing. Beatific smiles spread across our faces as we considered our porky love and suggested different products and cuts of the beast, but, after much debate, a surprising consensus form between us, with only two points of disagreement. Let us know what your favorite pork products are and win a package of pork-related kitchen goodies. mmm. Pork! I’m with you… I have quite a fondness for the beloved Pig! Do I have to narrow it down to five? 2. The stewed pork ribs that they serve with sour vegetables at my favorite Chinese restaurant in Boston – Chau Chow City. You two are too much…fun idea and fabu photo! Can’t top your list but I’ll look forward to others’ comments. Jamon iberico would have to be 1st on my list, followed closely by guanciale. And there’s something special about bits of smoked hock or shank in a pot of beans. I can literally bite my computer screen. Yes – let’s hear it for the swine! Without doubt the finest animal for eating 🙂 My every growing paunch is like a tribute to the delicious pig – oink oink. I am a big fan of pork as well. I love pork tenderloin and pork belly. And of course pulled pork sandwich! 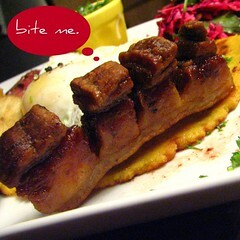 But my first love of pork is from my childhood in Ukraine where the favorite pork product was smoked pork fat or ‘salo’. Only five? What about breakfast sausage patties, pulled pork, pork tenderloin, pancetta, and mmm—fall off the bones tender smoked ribs. I could go on and on: speck, prosciutto, smoked ham hocks. I am sure by now, you can tell we are pretty in-fat-u-ate-d with all things porcine. 1. Pork belly. For me, this is an easy #1. I can’t think of anything else that has the texture combination of a well-made pork belly: shatteringly crisp skin, meltingly supple fat, savory salty meat. And the flavor just seems to be the best of the pig, condensed into one, perfect, pork product. 2. Jambon iberico. If only this weren’t so ridiculously expensive. For those who haven’t tried it, it’s worth every penny (and for those who have, you know that already). 3. Guanciale. Melty savory fat, perfect in pretty much everything– sauces, casseroles, pasta… I could go on. 4. Chinese roast pork (char sui). God this stuff is good. The perfect combo of crispy skin and meaty meat. I like to eat it plain, hacked off the roast in large chunks (with extra skin! ), but it’s also fantastic in dim sum (char siu bao). 5. Pork tenderloin. I realize the flavor of this lean cut does not come close to that of any of the fat-laden items on my list above, but pork tenderloin is easy to make and always good. I love to cut it into medallions and sear them, then make a buttery pan sauce. 1 Slow roasted belly of pork. 3 Boiled green collar ham with parsley sauce. 4 Brawn – made by my brother and eaten with my brother. 5 crispy pigs tails at St John. Of course you’re right here…Who could like anything better than pork?..If I could, I’d add my vote to those of slow roasted belly too! I bought a quart hog a couple weeks ago, and am already a little tired of pork. Guanciale on pizza, chorizo in eggs, proscuitto with mozzarella/cornichons and fresh basil on ciabatta, maple bacon wrapped around dates, sage pork tenderloin with orange marmalade glaze, smoked honey chipotle ribs, ham and cheese crèpes from Parisian street vendors, ground pork and ginger dumplings! Thick hand-cut bacon from the butcher. 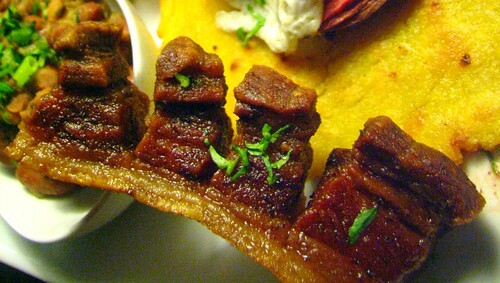 Carnitas – the same as above but from the Mexican market, cooked and ready to make into tacos. Thick-cut bone-in pork chops. Stuffed. Great post! Love reading everyone’s favorites. I love pork too, especially bacon, prosciutto and braised pork shoulder! I’m getting hungry just thinking about them all! Wow, those pictures are just awesome, I mean WOW! I would never turn down a perfectly cooked pork chop – on the bone. I love bone in hand scraping every last bit off with my teeth. And I’ve got a huge soft spot for pork belly! Iberian Acorn Ham goes first… no doubt! And I could go on and on 😀 😀 :D. Pork to the Power! Hello! I’m picky about the source of the pork first (humane treatment is a hot-button of mine) but once that’s taken care of, no doubt and in no particular order other than top of mind. oh yes to guanciale and jamon iberico. i’ll have to add lardo to that list. decadently delicious. and i recently had a proper boudin sausage made by a gentleman who sells at the farmer’s markets in new orleans, it is sublime. and while on new orleans and pork, cochon, my favorite restaurant in town that also happens to be a contemporary cajun ode to the pig makes an amazing cochon du lait. and they’ve recently opened a butcher shop as well! Pick out just 5 pork products? I’m not sure I could. There are so many that I love. See, my 5 are more in the category than the actual pork product. I just love pork!! I realize that availability for these three is limited to people who come to my house, but there they are. I can’t prioritized these, but my favs are Virginia country ham, thick handcut bacon, prosciutto, serrano ham, and BBQ ribs with a good finger licking sauce. Thanks for all your great answers. The contest is closed and a winner announced! Oh so I missed the contest but I wanna bite outta that pork! Hmm, I missed this. Loved to hear Char Siu is being voted!